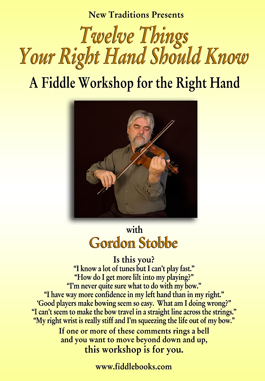 This workshop is the result of right hand workshops Gordon has conducted at a number of fiddle camps in recent years. Most fiddle players spend a lot of time devoloping a rich and interesting vocabulary for their left hands-- jigs, waltzes, reels, scales, arpeggios, the list goes on. Sadly, the right hand is often left behind. With the help of a wonderful group of Canadian fiddlers in real time and slow motion, this workshop helps the right hand develop skills and confidence in several areas. Why a good bow grip is the most important part of good fiddle bowing. How to build and modify your bow grip to suit the music you play. When to bow from the elbow, when to bow from the wrist. How to use your grip to create accents that sparkle. How to develop a variety of bow patterns. How to use your wrist effectively on string crossings. How to build a vocabulary of right hand ideas beyond down and up to make your playing more fun and more exciting. This DVD Workshop has a running time of just over one hour and includes chapter headings for the ease of navigation to specific topics. The Fiddler's Red Book of Scales and Arpeggios. 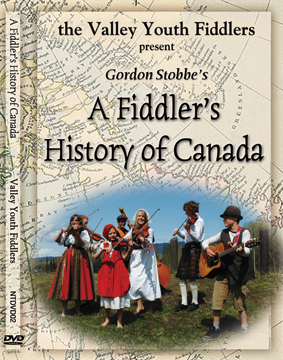 Gordon Stobbe's A Fiddler's History of Canada tells the story about the coming of the first fiddle from Europe, its travels across our great land and the joyous music that has inspired us to dance for more than 400 years. In this two hour live recording DVD, the Valley Youth Fiddlers use music, song, dance and narration to tell a compelling and entertaining tale of the folk life of Canada, tracing the travels of this humble instrument across the length and breadth of Canada. 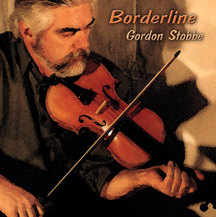 Gordon Stobbe’s new recording “Borderline”, follows in the footsteps of his earlier work,”Solo”. This CD features 14 new compositions, some written for fiddle workshops, some written for individuals, all reflecting his musical curiosity and range of interest. As on his earlier recordings, melodies and arrangements share the stage with a wide variety of instruments -- fiddle, mandolin, acoustic and Weissenborn guitars, lap steel, accordion, percussion, bass and human voice. From two-step to swing to meditative lament, this new recording covers a lot of ground. If you have enjoyed earlier CDs from the Fiddlebooks catalogue, this one’s for you. Transcriptions of all tunes on this CD are available in the book Borderline. but they are soaked in a United Nation of traditions." "Stobbe is an excellent player with a real gift for melody." "Stobbe's playing, whether exuberant or restrained, is fine enough in itself, but what makes the album especially noteworthy are the distinctive tunes. They stand out one from the other, and a few of them, such as 'Time Goes By', are instantly memorable." 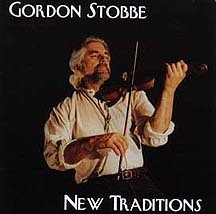 Transcriptions of all tunes on this CD are available in the book New Traditions. "A lovely new album, 'Small World' opens its arms to embrace fiddle styles from around the world - from the moody 'Valse Russe' to the old-timey 'Last Day In Town' to the joyful foxtrot 'The First 50'." The latest recording of 22 new fiddle tunes including 5 tunes co-written with other fiddlers from Ontario to Washington state . Alongside the usual fiddle accompaniment of guitar, piano and bass this CD features tenor guitar, mandolin, clawhammer banjo, accordian, mountain dulcimer, harmonica and percussion. 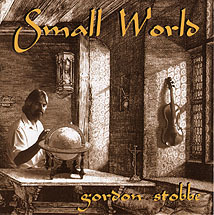 Transcriptions of all tunes on this CD are available in the book Small World. 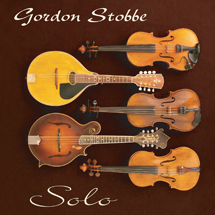 This is Gordon Stobbe's third recording of original music. Three tunes on this CD were co-written with Canadian fiddlers Calvin Vollrath, John Arcand and Bernie Jaffe. Alongside the usual fiddle accompaniment of guitar, piano and bass this CD features tenor guitar, mandolin, clawhammer banjo, accordion, mountain dulcimer, harmonica, bouzouki, lap steel and percussion. Stylistically, Seaforth Waltz tips its hat to the English and French Canadian fiddle tradition with side trips into the swing world and Eastern Europe. The Yo-dells appear with some voca-fiddle music and the historic Old Carlton Trail is commemorated in music. 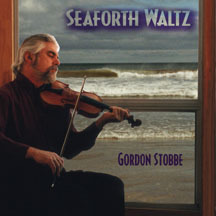 Seaforth Waltz continues Gordon's exploration of the rich and varied world of the folk fiddle begun with his earlier recordings, New Traditions and Small World. Transcriptions of all tunes on this CD are available in the book Seaforth Waltz. 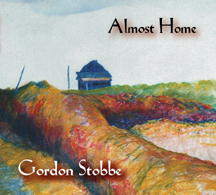 Almost Home is Gordon Stobbe's fourth recording of new music for the fiddle. Although these tunes are recent their roots trace back to the players and composers of an earlier time. The roots of Canadian fiddle music can be followed back to parts of Europe which gave us our first settlers. Players drew on inspiration from the land, communities, friends and family. First Nations and Métis players added their rhythms and melodies to this Canadian repertoire. Canadian fiddle composers have bequeathed us a great legacy of music. Their work inspires many of us to do likewise and find our own melodies to add to the great river of Canadian fiddle music. Several of these tunes came from happy hours spent with musical friends: Oliver Shroer, Calvin Vollrath, Patti Lamoreux, Mike Sanyshyn and Emilyn Stam. Transcriptions of all tunes on this CD are available in the book Almost Home. My new CD, "Solo", marks a change from my previous recordings. Instead of a repertoire of just my own compositions, "Solo" features a mix of traditional and original tunes. On "Solo" the emphasis is on the interplay of instruments, two and three part harmonies, and arrangements which brings out a different look at older standards. "Solo"s focus is on tones and textures of a wide range of musical instruments that make their home in my studio. It has been my great pleasure to travel with them as they sing, speak, harmonize, comment, joke and sometimes argue their way through this collection of tunes new and old. Hopefully their efforts will bring you pleasure as well. Transcriptions of all tunes on this CD are available in the book Fiddle Harmony. 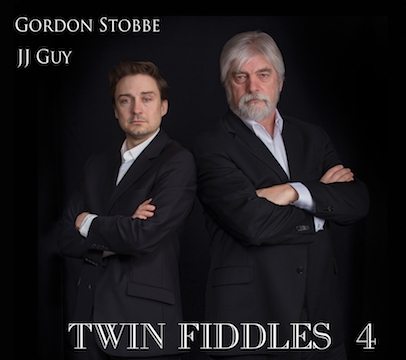 The tunes on this new CD, "Twin Fiddles", were written and recorded by Gordon Stobbe and JJ Guy as they traveled the Canadian North and West together, teaching and performing. The tunes were inspired by people and places across this great Canadian nation. Transcriptions of all tunes on this CD are available in the book Twin Fiddles. fiddlers, fellow travelers and storytellers, J.J. Guy and Gordon Stobbe. The tunes celebrate music, dance, friendship and landscape across Canada, all the while continuing and expanding the tradition of twin fiddling. 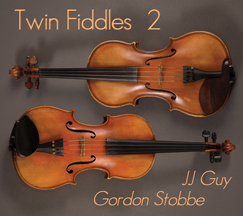 Transcriptions of all tunes on this CD are available in the book Twin Fiddles 2. 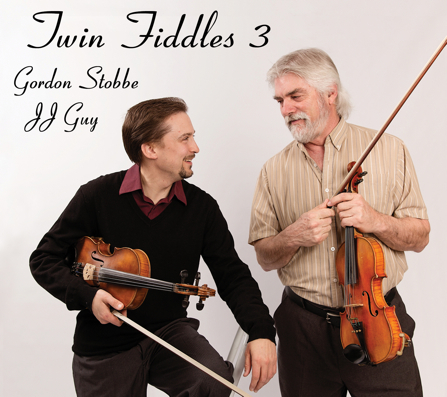 Transcriptions of all tunes on this CD are available in the book Twin Fiddles 3. 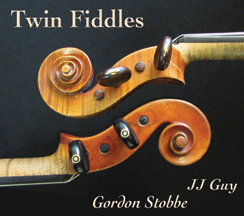 Transcriptions of all tunes on this CD are available in the book Twin Fiddles 4. "It is like a fast train of musical delights speeding across the horizons of your hearing. The ultimate traditional fiddle album." --Gerry Taylor, The Telegraph Journal in Saint John, N.B. This collection features 69 timeless old-time fiddle classics selected from cross-Canada jam-session lists compiled by fiddlers, accompanists and fans. Includes regional favourites from Western Canada, the Ottawa Valley, Quebec and the Maritimes. 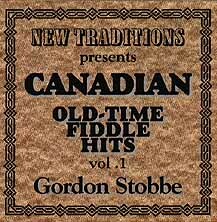 This CD is also available with the book Canadian Old-Time Fiddle Hits Vol.1. This CD is a continuation of the collection of Canadian old-time fiddle classics. This anthology contains 76 tunes and includes a special group of Canadian fox-trots. 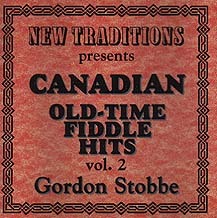 This CD is also available with the book Canadian Old-Time Fiddle Hits Vol.2. This CD is a continuation of the coast to coast collection of Canadian old-time fiddle classics. This anthology contains 78 tunes and includes tunes written by some our great composers. 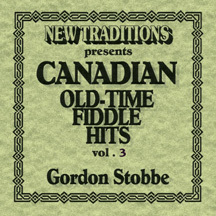 This CD is also available with the book Canadian Old-Time Fiddle Hits Vol.3. "This album sets Belmore up as a queen of Country Folk music. Her voice is pure and clean and her band The Mighty Oak String Band is flawless. Listening to this CD you feel you are in the same room as the instruments, you can hear skin on strings on this immaculate recording. ... This CD is a must have and I wish I could give it even higher marks than 12 out of 12." This album is a mix of the many different music styles that Betty has sung over the years. Its unique strength and beauty derives from the fact that the dozen songs on it are her personal favourites culled from hundreds she has performed in concert and on radio in a career that spans a quarter century. 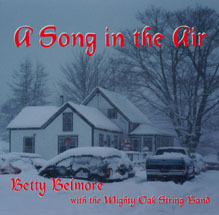 "Old-time music aficionado Betty Belmore went for a friends -and-family vibe on her new Christmas CD 'A Song in the Air' which recreates memories of growing up in Caribou Gold Mines, Nova Scotia. 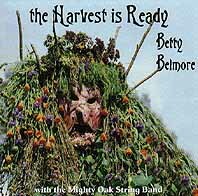 Songs like the Staple Singers' 'There Was A Star' and Tennessee Ernie Ford's 'Christmas Dinner' ....Belmore and her musical pals The Mighty Oak Stringband weren't interested in following the usual footprints in the snow. One treat to look forward to is the old novelty tune 'Barnyard Christmas', originally recorded by Spike Jones and the Bell Sisters." Singing has always played a special part in Christmas. With my family, friends and neighbors, at home, in church or carolling door-to-door, it's my favourite part of the holiday. Singing together is the best Christmas gift I can think of, to give and to receive.